When Sabhie Qadeer first got his exam schedule for this semester and saw he had three exams in 24 hours, he felt stressed. The second-year mechanical engineering student has five exams in total, but three of them are a little too close for comfort. His three-hour law exam starts at 3 p.m and is followed by another three-hour engineering design exam at 6 p.m. on the same day. Then he has to be back for his statics exam at 3 p.m. the next day. And, to make matters worse, he lives an hour and a half away by transit. 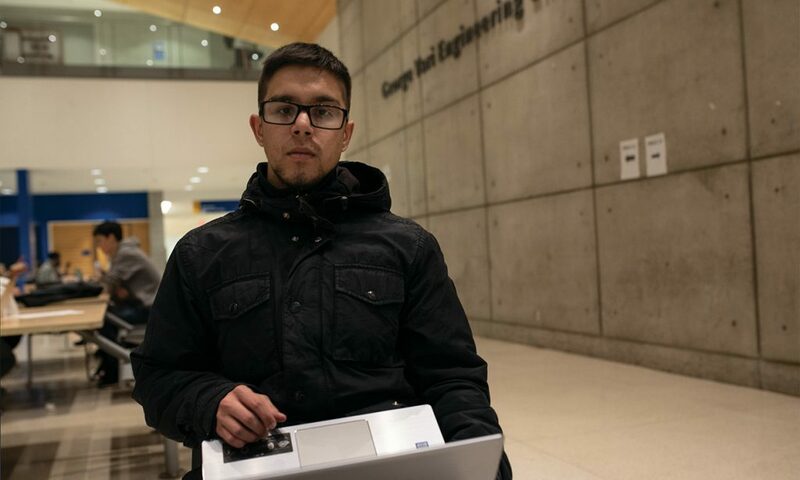 “I just thought it might be difficult for me to manage that exam schedule,” Qadeer said. Despite having three three-hour exams in 24 hours, Qadeer doesn’t qualify for an exam rescheduling. Under the current exam policy, the university considers an exam overload to be three exams “on the same day” or “three consecutive exam sessions.” The example Ryerson gives of consecutive sessions is an exam in the afternoon, an exam in the evening on the same day and an exam the following morning. This information is summarized in one line on the final exams schedule page of the Registrar’s Office website. Qadeer saw the line but figured it was worth the effort to ask to reschedule anyway, since his exams were so close together. “I was initially very taken aback with the heavy schedule…so I wanted to check all my options as soon as possible,” he said. First, he called the ServiceHub for more information. They sent him to his department administration. Once there, he was given a meeting with the department associate chair. After they reviewed his situation, Qadeer was denied. The policy was updated in October 2018 to define exam overloads as explained above. The previous policy only considered three exams in one calendar day an exam “conflict” and did not consider consecutive exams a valid reason to reschedule. Angelo Licari, a fourth-year undeclared student, was in second year when he had three exams in 24 hours. Licari had one exam on a Tuesday morning, another in the afternoon and a third on Wednesday afternoon. All three were marketing exams and took place within 24 hours, but spread out between the two days. “I didn’t reschedule. To be honest I didn’t really know how. I asked my profs and they said you need to submit a form or something so I just grinded it out,” he said. Licari said his decision to go through with the exams on the assigned dates was in part due to the rescheduling process seeming cumbersome. But mainly because the makeup date would have been well after his other exams, and he wanted to go home to Ottawa for Christmas break without having to worry about taking a makeup exam. In the end, he passed all of the exams but believes he could have done better if they were more evenly spaced out over the exam period. “I think if the professor’s communicated [the policy] to the students so we knew it was an option [to reschedule] if we had three exams in about 24 hours and an easy link to get us the information that would be helpful,” he said. At the time, Licari wasn’t eligible for an exam rescheduling because his three exams did not fall on the same calendar day. Still, even under the new policy he would not be eligible for a reschedule because the third exam was not consecutive. Ryerson has four exam start times, 8 a.m., 12 p.m., 3 p.m. and 7 p.m. When the university is determining whether — or not — a student qualifies for an exam overload, they are basing their decision on these times. At a senate meeting in December 2017, the examination policy review committee presented a suggestion from students that Ryerson should expand the policy to consider more than two exams in 24 hours an exam overload. However, in the same presentation, the exam scheduling department said that expansion would be “​extremely​ ​difficult,​ ​if​ ​not​ ​impossible” to execute because the 24 hour period would vary drastically between students. The university is currently at a classroom utilization rate of 92 per cent, one of the highest in the province, but the university continues to grow. Between 2015 and 2016 the number of exams at Ryerson increased by 10 per cent from 99,740 to 111,562. The review committee also showed that in 2016, 137 students had two exams at the same time. Another 92 students had three exams on the same day and another 74 students had three consecutive exams. However, these numbers don’t account for the students who have missed the margin for consecutive exams by a small window — students like Irshad Busawon, a fifth-year civil engineering student. Busawon is taking three courses this semester and all three of his exams fall within 24 hours. His first exam is at 7 p.m. on one day, his second exam is the following day at 12 p.m. and then his final exam is 7 p.m. that evening. Like Qadeer and Licari, Busawon did not fully understand the current exam policy and didn’t know students could qualify for a rescheduling. He said his usual plan is to bypass the department and go straight to the professors to ask to write the exam at the makeup date. But the last time he wrote a makeup exam, he failed it. “I remember I got there and I opened the paper and I didn’t know anything. I left within 10 minutes of it,” he said. The current policy is not set to be reviewed again until winter 2020. But the media relations officer at Ryerson said the academic policy and governance committee has a sub-committee looking into how to best schedule makeup exams. “Hopefully we will be able to find some solutions to make the process smoother for students in the near future, and in the meantime, they should reach out to their program department if they need assistance,” she wrote in an email. The Ryersonian also reached out to Student Learning Services and Student Care at Ryerson to find out what they’re doing to help students in this situation. Student Learning Services declined to comment and Student Care did not get back in time for publication. In the meantime, students will be studying for their exams through to the end of the semester. Although, some have it a little worse than others. What’s the new exam policy?